Sierra Madre Pioneer Cemetery sits on 2.3 acres in beautiful Sierra Madre, California. The cemetery was established in 1882 by Nathaniel Carter, the founder of the city, and sits among coastal live oaks and Englemann oaks. Many of the original founding families of Sierra Madre are buried here, as are veterans from the Civil War to Vietnam. The first person buried here was Carter's servant, J. E. Richardson, on July 3, 1882. 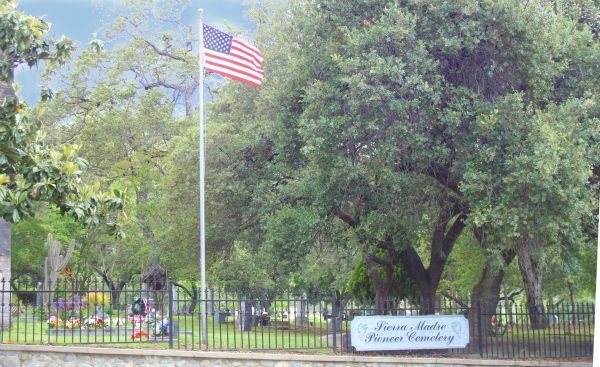 The Sierra Madre Cemetery Association was organized in 1961, and is responsible for maintaining the cemetery today. You can read about the history of the cemetery and view the Picture Gallery. To contact someone regarding the cemetery please see the Contacts page. For directions and a map of the cemetery click here. A directory of plots is available by searching our database.